In the good old days, when times were easier and computers where the size of microwaves, the media plan was simple: keep your focus on print advertising and TV. In the past couple of decades, the media landscape became more fragmented, bringing up complications. As you already know, the obstacles are in looking at the life of our potential clients all-inclusively. It’s all about getting quality leads, and social media is obviously the way to go. Try and utilize Facebook Offers, which are a type of Facebook ad that works differently when compared to traditional Facebook ads. You’ll be able to set them up right on your company’s Facebook page. In addition, you can even create them for both online and offline businesses. So, how will these give you an advantage in engaging your customers and potential customers? There is six times more engagement for Facebook Offers than there are for the ads in the right-hand column of Facebook. You’ll be able to hyper-target your offers, ensuring that only Facebook users who show a genuine interest with your business will see them. When your potential customers open up their e-mail, they will get a link to your website/opt-in page. These types of offers will hook in and engage with customers through something free that they can earn by following your directions. For example, you can offer clients a free trial of some sort, or even a discount. When you get visitors to register to your website, Intercom will add their information to your database, including their social media. The Intercom database will allow you to view user profiles, and allow you to see various information, like the day they signed up and times that they’ve visited. Additionally, you can send messages to particular users, and also see a list of open replies to respond to. Essentially, Intercom will allow you to thoroughly understand how your product is being used. It also gives you the opportunity to reach out to quality users for feedback. This convenient program will also rate the strength of your relationships between you and your website users. Using Intercom as an engagement with your customers is obviously beneficial, but you need to extract information that’s important to keep your customers interested. This is why you should offer a trial period (30 days or less) for your product or service, and utilize Intercom to gauge the pros and cons. What features of your product or service should you emphasize? Interact with your trial-run visitors through Intercom to get valuable customer feedback to see what features stood out, and really got them thinking about making a purchase. Then you can start making changes, and refining the shape of your promotion, within the lines of the two things customers want: a way to solve a problem or a way to have fun. This program will make it easy for you to add a chat feature to your website, so you can answer questions and communicate immediately with your clients. Olark has many designs and sizes for chat boxes, so that it can seamlessly integrate with your particular site. In addition, you’ll be able to customize your offline message and your welcome message as well. Once a customer clicks on the box, a message will open on your end in an IM program where a chat can occur. You can also view transcripts on Olark and send them to customer relationship analysis programs. Now, with Olark, you’ll be able to chat with your customers, and handle some of their questions, but definitely not all of them. 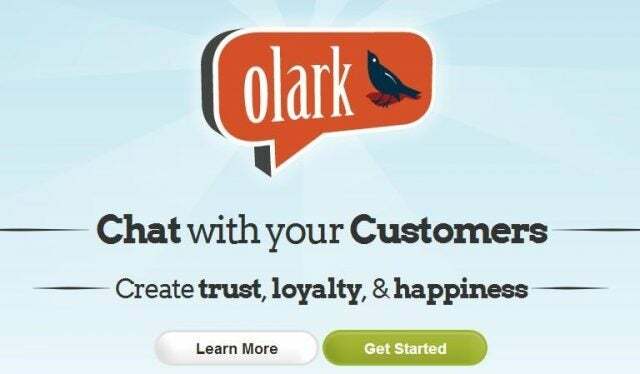 Coupling the utilization of social media with Olark is the answer in using Olark to its full potential. Social media, like Twitter or Facebook, gives you a large voice for your audience to listen to. This means, if you’re seeing the same problems pop up on the Olark messages, you can answer back through Facebook or Twitter, making announcements that will clear the same problem for plenty of people. In addition, if you do happen to be offline, you can construct your offline message to lead your customers directly to your Facebook or your Twitter so that they can get the answer to the issue that everyone was bringing up. Remember, in constructing a message for your auto-responder, along with the invitation, tell them why they should follow your Twitter or like your Facebook page. Taking this a step further, utilize your Facebook and Twitter pages to give your customers a voice. By asking your target audience something, you’re giving them permission to speak, and building the trust that you truly want to shape your company to their preferences. You can also re-tweet customers on Twitter or like customers’ posts on Facebook to influence more interaction. What do people want? Answers. They want a site they can go to and find answers in the particular field you’ve deemed to be an expert in. In being a Wikipedia of your industry, you won’t only show your customers that you know your product, you’ll give them another reason to come back. People have grown more impatient on the Internet, because if they can’t find the answer immediately, they know that with enough search queries, they’ll get to their answer quicker than if they are rummaging through a site with poor navigation or minimal answers. The average business site will provide customers with about 10 answers on their FAQ page, but you can go beyond that, and really give them tips on using your product, or even anything relating to your product. This can come in the form of blogging on a weekly basis to keep your customers engaged. Use the “they ask, and you answer” mentality when creating your business website. Additionally, you can even create a Wikipedia page for your business. Choose which tools will help you engage with your customers the correct way. You always want to leave the door open for customer engagement, and all of these tools and methods will aide you in doing so. If you’re starting out, and you want to give your business a website, check out Whoishostingthis.com to search for the web host that’s ideal for you.